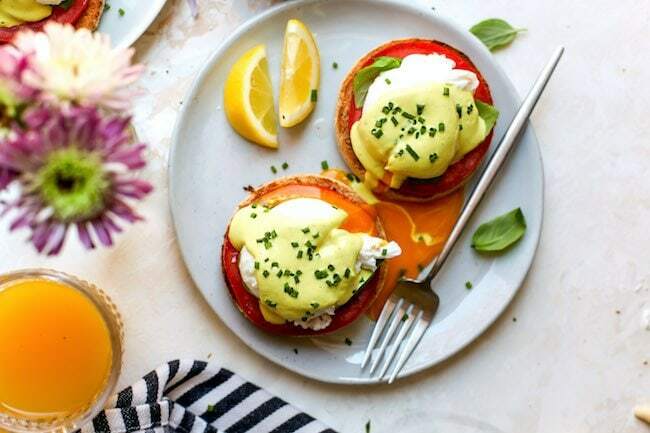 Caprese Eggs Benedict made with tomatoes, basil, poached eggs, and a healthy hollandaise sauce. This is the perfect Eggs Benedict recipe for spring and summer. If you like caprese salad, you are going to love this Eggs Benedict recipe. This twist on the classic Eggs Benedict is breakfast perfection. You get all of the same amazing flavors, but in Eggs Benedict form! 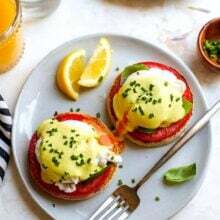 Eggs Benedict is always a classy and delicious breakfast choice and this caprese version takes the original to a new level. You will love the tomato basil addition and the hollandaise sauce is amazing! This recipe comes from the new Love & Lemons Every Day cookbook by my friends Jeanine and Jack. I love Jeanine’s recipes because they are always so healthy and fresh. 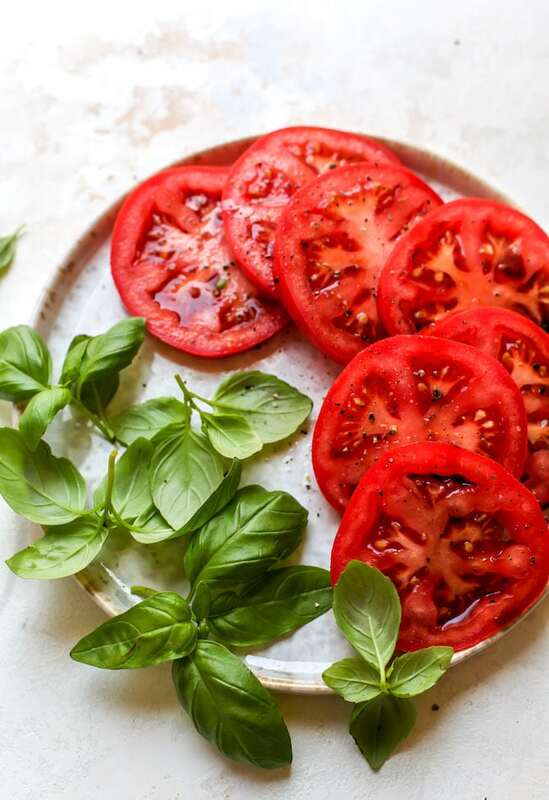 I love how she incorporates lots of fresh and vibrant produce into every single recipe. Her new book is filled with healthy and delicious vegetarian recipes and I seriously want to make them all. I am so glad I started with this eggs benedict recipe because the hollandaise sauce is a major game changer. Traditional hollandaise sauce is made with is an emulsion of egg yolk, melted butter, and lemon juice. It is usually seasoned with salt, and either white pepper or cayenne pepper. 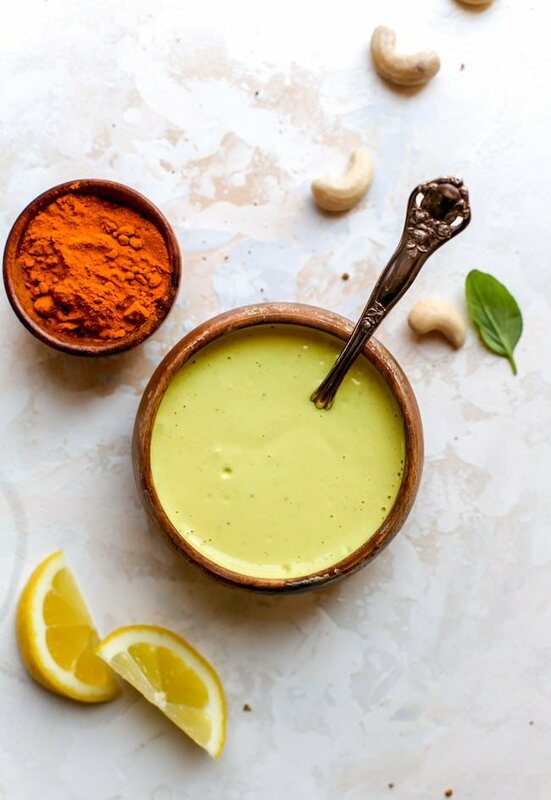 This healthier hollandaise sauce is made with cashews, olive oil, lemon juice, garlic, Dijon mustard, and ground turmeric. The flavor is SO good and it is SO easy to make. You combine all of the ingredients in a powerful blender and let the blender do the work. It is a fool-proof hollandaise sauce! You can make the hollandaise sauce in advance, it will keep in the fridge for up to 5 days. Stir before using and add a little water if you need to thin it out a little. Poached eggs can be a little tricky to get the hang of, but don’t worry, I am confident you can master them. It just takes a little patience. Crack the first egg into a small bowl. Heat a medium pot of water until bubbles form on the bottom of the pan but the water is not yet boiling. Add a few splashes of white vinegar. Adding vinegar increases the acidity to the poaching water and makes the whites firm up even faster to prevent them from dispersing in the water. Stir the water so that it moves in a circular motion. Gently drop the egg into the water, give the water one more gentle stir, then set a timer for 4 minutes. Lift the egg out of the water with a slotted spoon. Test the egg for doneness and determine if you need more or less time per egg. Continue with the remaining eggs. If you are comfortable with the technique, you can poach two at a time. After you make the hollandaise sauce and poach the eggs, it is time to assemble the caprese eggs benedict. Place two halves of the toasted English muffins on a plate and top each half with a tomato slice, a basil leaf, a poached egg, and a generous drizzle of the hollaindaise sauce. Season with salt and pepper to taste, top with fresh chives, and serve immediately. 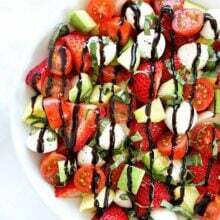 Caprese salad is made with fresh mozzarella cheese, but there is no cheese used in this recipe to keep things on the lighter sauce. I promise, you won’t miss the cheese because the eggs are so creamy and the sauce is so silky and rich. If you really want to go all out, you can top the toasted English muffin with a slice of fresh mozzarella cheese and continue assembling the eggs benedict. 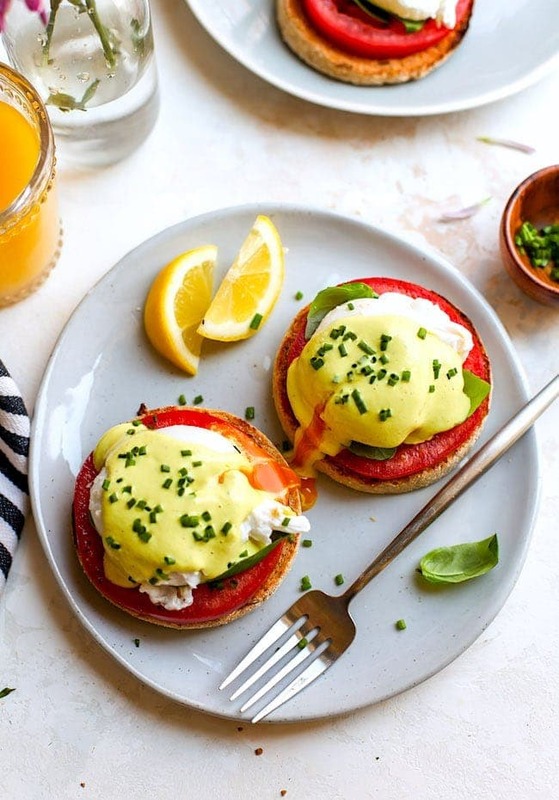 Eggs Benedict is a breakfast and brunch favorite and this caprese version is extra special. 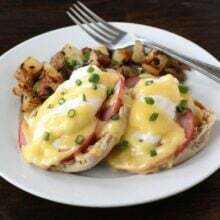 It is the perfect eggs benedict recipe for Easter, Mother’s Day, Father’s Day, Christmas, or any special occasion. We also like to make eggs benedict for Sunday brunch. It is easy to make at home and just as good, maybe even better, than ordering eggs benedict at a restaurant. Eggs Benedict made with tomatoes, basil, poached eggs, and a healthy hollandaise sauce. 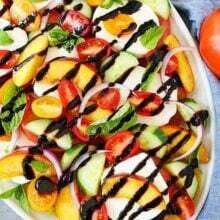 Place the sliced tomatoes on a plate, drizzle with balsamic vinegar, and season with salt and pepper. Set aside. Make the hollandaise sauce: In a high-speed blender, place the cashews, water, olive oil, lemon juice, mustard, garlic, turmeric, salt, and a few grinds of black pepper and process into a smooth sauce. Transfer to a small bowl and set aside. The sauce can be made in advance and stored in the fridge. Make the poached eggs: Crack the first egg into a small bowl. Heat a medium pot of water until bubbles form on the bottom of the pan but the water is not yet boiling. Add a few splashes of white vinegar. Stir the water so that it moves in a circular motion. Gently drop the egg into the water, give the water one more gentle stir, then set a timer for 4 minutes. Scoop the egg out of the water. Test the egg for doneness and determine if you need more or less time per egg. Continue with the remaining eggs. If you are comfortable with the technique, you can poach two at a time. To assemble: When you are ready to serve, check the sauce, if necessary, stir in a tiny bit of water so it’s a thick but drizzleable consistency. 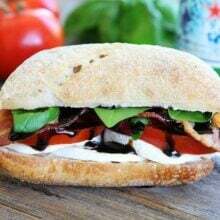 Assemble each plate with two halves of the toasted English muffins and top each half with a tomato slice, a basil leaf, a poached egg, and a generous drizzle of the sauce. Season with salt and pepper to taste, top with fresh chives, and serve immediately. The sauce will keep in the fridge for up to 5 days. Recipe from Love & Lemons Every Day by Jeanine Donofrio.